Bird's Custard used on the top bar, Jell-O on the bottom. Ever since posting my award-winning Nanaimo Bar recipe here on my blog, I've had several people tell me (and post on Pinterest) that they are not REAL Nanaimo Bars because I do not use Bird's Custard Powder in the middle layer. I've never been able to find it in any markets where I live, so I've always just subbed Jell-O instant vanilla pudding. I've always thought those Canadians who criticized or corrected me were being sensitive, that there really couldn't be THAT big of a difference between the two. They look almost the same, right? Well, after finally purchasing some Bird's Custard Powder on Amazon.com, I've realized that all of those pushy Canadians are right: Nanaimo Bars do, in fact, taste better with the Bird's. They just do. As my husband said, "I feel like I can just eat more of these ones." This helps explain why I found it so easy to eat three very large Nanaimo Bars the first time I had them at Portland State University so many years ago. 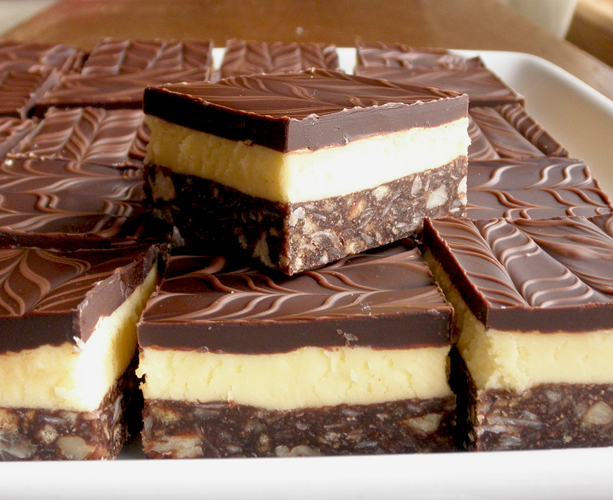 These are the Nanaimo Bars I fell in love with, and I'm glad I finally gave in and bought the Bird's. I had a few friends over to help me with the tasting, and four of five of us agreed that the Bird's Nanaimo Bars tasted better, lighter, less sweet than the other. My friend who preferred the Jell-O pudding ones is a sugar lover, so she likes hers sweeter. The Bird's bars, in addition to tasting a bit lighter, had a more distinct coconut flavor--not overwhelming, but subtle, and I liked it. 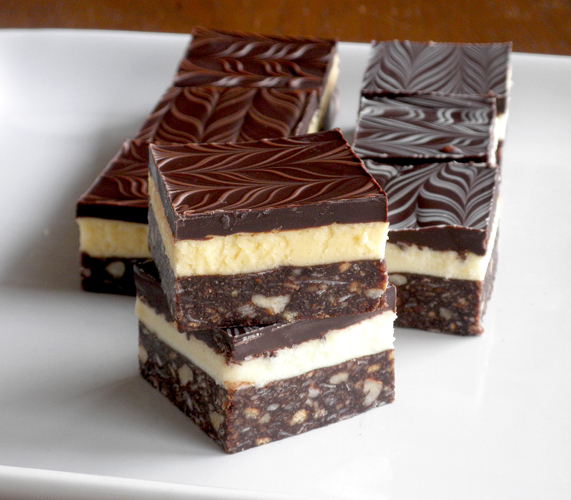 So, if you're going to try a Nanaimo Bar recipe, try this one. They're awesome. Bottom Layer: In a 300° oven, toast coconut and chopped pecans until golden brown and fragrant, stirring occasionally. (This toasting is optional, and not necessarily traditional, but I like it.) Remove from oven and set aside. In the top of a double boiler, melt ½ cup butter and cocoa and sugar. Whisk to combine. Whisk in the beaten egg. Whisk until thickened, and then remove at once from heat. Fold in the graham cracker crumbs, coconut, and pecans. Press into prepared pan. Put in refrigerator while you prepare the next layer. Middle Layer: In a large mixing bowl, cream together ½ cup softened butter, half & half, and custard powder. Fold in the powdered sugar. Beat until very light. Spread evenly on top of the first layer. Cover with plastic wrap. Put in refrigerator again for an hour or so, until middle layer is firm. Note: Be sure to remove any foil or parchment paper that may have stuck to the bottom of individual bars. *I've created a post that gives explicit instructions and photos on how to make the "feathery" lines you see on these bars: How to Make Those Feathery Lines on Nanaimo Bars. They have Bird's at The Gateway Market here in DSM and often at World Market. My Dad's British, so we grew up eating it + it's a def must. Am making these bars this week - again, thanks! Hi, are you using salted or unsalted butter? Seeing just "butter" am I to assume that's unsalted? I've seen both listed in different recipes and have no idea which one to use now! Thank you! For recipes here on my blog when I say "butter" I mean salted butter. I specify "salted butter" when it's important to use I salted butter. Does that make sense? It only makes a difference in a few recipes, in my opinion. Can you please tell me how do you cut these bars to get a very clean cut? Do you use a very sharp knife or a serrated knife? Do you cut in a sawing motion or straight down? Oh, and I also wipe the knife clean with a wet paper towel between each cut. THANK YOU SO MUCH! I made these about 4 times already and they were WONDERFUL. And I did manage to get very clean cuts thanks to your instructions! Can you use anything in place of the Bird's Custard Powder? I have been having trouble finding in my Sacramento, CA area. 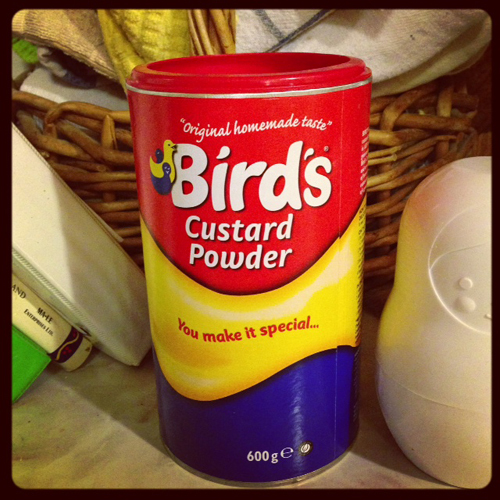 You can use Jell-O instant vanilla pudding powder instead of the Bird's Custard Powder. The Best Mexican Restaurant in Des Moines...?